Lowers the foe’s Attack stat. X It is timid in spite of its looks. If it becomes enraged, however, it will strike with its huge fangs. X Es ist trotz seines Äußeren schüchtern. Wird es wütend, schnappt es mit seinen Fängen zu. X En dépit des apparences, c’est un grand timide. Quand il s’énerve, il mord de ses énormes crocs. X A pesar de su aspecto, es muy tímido. Sin embargo, cuando se enfada, ataca con sus colmillos. X Malgrado il suo aspetto, è molto timido. Se si arrabbia, tuttavia, colpisce con le sue enormi zanne. X 얼굴에 어울리지 않게 겁이 많다. 그러나 한번 화내기 시작하면 큰 이빨로 반격한다. Y It can make most any Pokémon run away simply by opening its mouth wide to reveal its big fangs. Y Es kann fast jedes Pokémon vertreiben, indem es sein Maul weit öffnet und seine scharfen Reißzähne zeigt. Y Il peut faire fuir presque tous les Pokémon en ouvrant très largement sa mâchoire. Y Con solo enseñar las fauces, conseguirá ahuyentar prácticamente a todos los Pokémon con los que se cruce. Y Se spalanca la bocca mostrando i grandi denti, quasi tutti i Pokémon fuggono spaventati. Y 커다란 입을 벌리고 두꺼운 송곳니를 드러내면 대부분의 포켓몬이 도망친다. 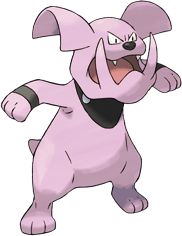 Omega Ruby Granbull has a particularly well-developed lower jaw. The enormous fangs are heavy, causing the Pokémon to tip its head back for balance. Unless it is startled, it will not try to bite indiscriminately. Omega Ruby Granbull besitzt einen besonders ausgeprägten Unterkiefer. Wegen seiner schweren Zähne wackelt es mit dem Kopf. Es beißt nur zu, wenn es erschreckt wird. Omega Ruby Granbull a une mâchoire inférieure particulièrement développée. Ses énormes crocs sont tellement lourds qu’ils l’obligent à pencher la tête. Il ne mord jamais sans raison, sauf quand il a peur. Omega Ruby Granbull tiene la mandíbula inferior demasiado desarrollada y colmillos enormes y pesados que le obligan a inclinar la cabeza hacia atrás para compensar el peso. Si no se le asusta, no muerde. Omega Ruby Granbull è dotato di una mascella inferiore particolarmente sviluppata. A causa delle enormi e pesanti zanne deve inclinare la testa per mantenersi in equilibrio. Se spaventato, può mordere in modo inconsulto. Omega Ruby 아래턱이 매우 발달한 포켓몬이다. 이빨이 무거워서 목을 기울이고 있다. 놀라게 하지 않으면 무턱대고 물지 않는다. 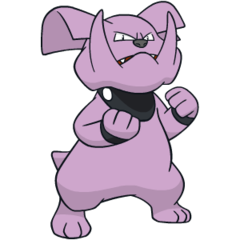 Alpha Sapphire Granbull has a particularly well-developed lower jaw. The enormous fangs are heavy, causing the Pokémon to tip its head back for balance. Unless it is startled, it will not try to bite indiscriminately. Alpha Sapphire Granbull besitzt einen besonders ausgeprägten Unterkiefer. Wegen seiner schweren Zähne wackelt es mit dem Kopf. Es beißt nur zu, wenn es erschreckt wird. Alpha Sapphire Granbull a une mâchoire inférieure particulièrement développée. Ses énormes crocs sont tellement lourds qu’ils l’obligent à pencher la tête. Il ne mord jamais sans raison, sauf quand il a peur. Alpha Sapphire Granbull tiene la mandíbula inferior demasiado desarrollada y colmillos enormes y pesados que le obligan a inclinar la cabeza hacia atrás para compensar el peso. Si no se le asusta, no muerde. Alpha Sapphire Granbull è dotato di una mascella inferiore particolarmente sviluppata. A causa delle enormi e pesanti zanne deve inclinare la testa per mantenersi in equilibrio. Se spaventato, può mordere in modo inconsulto. Alpha Sapphire 아래턱이 매우 발달한 포켓몬이다. 이빨이 무거워서 목을 기울이고 있다. 놀라게 하지 않으면 무턱대고 물지 않는다. Sun Its well-developed lower jaw and heavy fangs are its weapons. As long as it’s not provoked, it rarely bites. Moon More timid than Snubbull, this Pokémon is doted on by young people amused at the contrast between its looks and its attitude. Gold It is actually timid and easily spooked. If attacked, it flails about to fend off its attacker. Silver Because its fangs are too heavy, it always keeps its head tilted down. However, its Bite is powerful. Stadium2 It is actually timid and easily spooked. If attacked, it flails about to fend off its attacker. Ruby Granbull has a particularly well-developed lower jaw. The enormous fangs are heavy, causing the Pokemon to tip its head back for balance. Unless it is startled, it will not try to bite indiscriminately. Sapphire GRANBULL has a particularly well- developed lower jaw. The enormous fangs are heavy, causing the POKeMON to tip its head back for balance. Unless it is startled, it will not try to bite indiscriminately. FireRed Because its fangs are too heavy, it always keeps its head tilted down. However, its BITE is powerful. LeafGreen It is actually timid and easily spooked. If attacked, it flails about to fend off its attacker. Emerald It has a particularly well-developed lower jaw. The huge fangs are heavy, causing it to tilt its head. Unless it is startled, it will not try to bite. Diamond It is timid in spite of its looks. If it becomes enraged, however, it will strike with its huge fangs. Pearl It is timid in spite of its looks. If it becomes enraged, however, it will strike with its huge fangs. Platinum It is timid in spite of its looks. If it becomes enraged, however, it will strike with its huge fangs. HeartGold It is actually timid and easily spooked. If attacked, it flails about to fend off its attacker. SoulSilver Because its fangs are too heavy, it always keeps its head tilted down. However, its bite is powerful. Black It is timid in spite of its looks. If it becomes enraged, however, it will strike with its huge fangs. White It is timid in spite of its looks. If it becomes enraged, however, it will strike with its huge fangs. Black 2 It is timid in spite of its looks. If it becomes enraged, however, it will strike with its huge fangs. White 2 It is timid in spite of its looks. If it becomes enraged, however, it will strike with its huge fangs.